A rescue hero has been given a medal to mark his courage. George Parsonage - credited with having saved more than 1,500 lives on the River Clyde - has been given a silver medal by the Royal Humane Society. 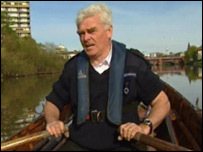 The 61-year-old received the lifetime award after rowing the Clyde for more than 25 years, carrying out rescues and pulling bodies from the water. It is the first award of its kind to be handed out by the charity for more than 100 years. Mr Parsonage received his award at the society's Annual General Court at Haberdashers' Hall in London on Thursday. Organisers said Mr Parsonage had made a unique contribution with his work for the Glasgow Humane Society. Mr Parsonage said: "I've never seen anybody drown, and God forbid I never want to see anybody drown. "I'm very proud of that, that any time I've seen somebody in the water, I've managed to get there and try and get them out." The life-saving group, reputed to be the oldest in the world, was founded in 1790 as a lifeboat service to rescue people from drowning in the Clyde, or recover their bodies. It originally had its headquarters in a house at the edge of Glasgow Green - nicknamed The Dead Hoose - but it was demolished in the late 1930s. Mr Parsonage followed in the footsteps of his father, turning the organisation into something of a family business. George Geddes manned the lifeboat between 1859 and 1899, until his son - also called George - took over until his death during a rescue attempt in 1931. He was then replaced by Mr Parsonage's father, Ben Parsonage, who served until his death in 1979. Mr Parsonage has worked in close co-operation with the emergency services and is on standby 24 hours a day but his role is under threat from health and safety rules. Strathclyde Police have said they can no longer ask Mr Parsonage to carry out rescue or recovery work on the river due to health and safety regulations.